You’ll find Watersound Beach real estate midway between Seagrove & Rosemary Beach on the gulf side of 30A, between Deer Lake State Park & Camp Creek Lake, one of 30A’s unique Coastal Dune Lakes. This luxurious gated beach community offers condominiums, homes and cottages built in a distinctive maritime architectural style. Wooden walk-ways wind along the lake’s shores and through protected dune areas providing access to the beach. Amenities: beach club, fitness center, pools and several parks. Watersound Beach homes for sale lie in a luxurious, coastal “New England inspired” gated beach community, adjacent to Deer Lake State Park. Watersound, FL homeowners are welcomed by an elegant entry known as "The Gate House" that sets a distinctive, maritime tone for this exclusive Northwest Florida beach community. With a fitness center, pizza restaurant, and post office, the Gate House also serves a convenient gathering place for homeowners and guests. Homes for Sale in Watersound Beach Amid Beautiful Preserved Land! 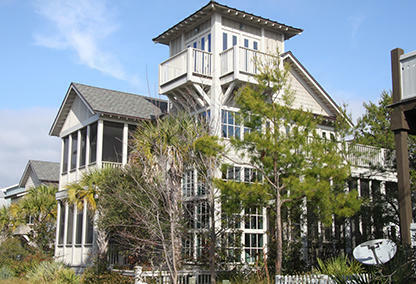 Watersound is situated on 400+ acres of dunes, scrub forest wetland areas and nearly a mile of beach frontage. Building exteriors of wooden shingle, earth tones and pale blues perfectly reflects the Nantucket/Cape Cod, coastal New England architectural style of the condominiums and homes available for sale in Watersound Beach, FL. Over half of the land surrounding the homes for sale in Watersound Beach, FL has been reserved as preservation and dune protection areas. A series of winding boardwalks meanders throughout Watersound and over dunes, providing several access points to sugary white beaches. 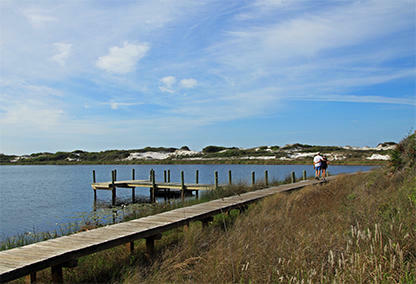 The eastern boundary of Watersound is bordered by one of 30A’s rare coastal dune lakes – Camp Creek Lake and is ideal for canoeing, kayaking or stand-up paddle boards. An iconic metal bridge spans the outfall of Camp Creek Lake and is a highly popular gathering spot for Watersound Beach home owners to watch the sunset over the Gulf of Mexico. Please feel free to contact us if you'd like to learn more about Watersound Beach homes for sale, or the any of the other resplendent communities along the 30A coastline. 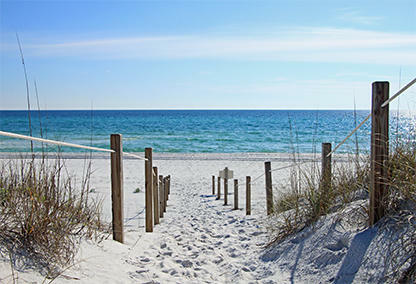 Davis Properties of Northwest Florida Inc. are eager to introduce you to this unique, coastal paradise.